Posted 11-15-2018 by Sherrel Stewart. Jimmy Smith of Collegeville asks the Health Department not to renew the emissions permit for ABC Coke. He holds a picture of his daughters, including one who died of cancer and another who is currently battling cancer. 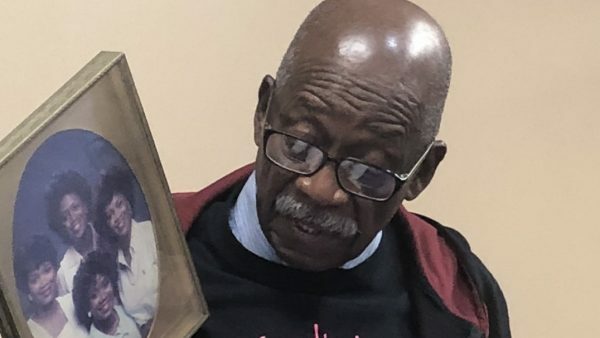 Jimmy Smith, an 86-year-old Collegeville retiree, held an 8×10 framed photograph of his four daughters in his hand when he stood Thursday to ask the Jefferson County Department of Health not to renew an air emissions permit for ABC Coke. He says his oldest daughter died of cancer and another daughter gets cancer treatments twice a month. He’s also a cancer survivor and a survivor of a community he says has been plagued with pollution for years. “Ya’ll can deny this permit, and I promise you they will get the message. They will clean up their act,” he says. Smith showed environmental test results that indicate 15 hazardous substances on his property. He was among about eight speakers at the first hearing Thursday on whether to renew the emissions permit for ABC Coke. Companies with air emissions are required to have permits renewed every four or five years, the health department says. About 40 people attended, including several who rode a bus from north Birmingham, an effort organized by Birmingham City Councilman William Parker. Residents and environmental activists have complained for decades about air quality in the industrial corridor around north Birmingham. Interest is heightened on the renewal of the ABC Coke permit. The company is owned by Drummond, which was at the center of a corruption trial involving a former state lawmaker, a company executive, and a lawyer. They conspired to block the U.S. Environmental Protection Agency’s cleanup efforts in the area. Charlie Mack Powell, president of the environmental group PANIC or People Against Neighborhood Industrial Contamination, also spoke at the hearing. Powell says people who live in the area with high soil contamination should be offered fair market value for their homes so that they can relocate. “The plant ain’t moving,” he says. Nelson Brooke, a board member with the environmental watchdog group GASP, wants the health department to require more stringent regulations on ABC Coke emissions and to protect the residents. The health department will review the comments from the hearings and send the information to the EPA. MAP: Where Are Birmingham’s Vacant School Buildings? WBHM’s Mary Scott Hodgin recently reported on surplus property owned by Birmingham City Schools. Vacant schools are a common sight throughout Birmingham. The buildings symbolize decades of population decline and budget cuts. As Birmingham’s city center and interest in historic properties grows, many hope these large structures will be revitalized. We’ve created a map showing where these empty schools are located. Take a look. What to Do With Birmingham’s Surplus Schools? Vacant schools are a common sight throughout Birmingham. The buildings symbolize decades of population decline and budget cuts. Now, as the city center grows, many hope these large structures will be revitalized. It’s not unusual to drive along some inner city Birmingham streets and see well-maintained homes alongside burned structures and weed-infested lots. For years, residents have complained, and, if they were lucky, some lots and abandoned property were cleared. This year, with millions more in the budget and new laws with penalties for owners who don’t maintain their property, the city is hoping to stop blight in its tracks. Birmingham has received national attention for its booming downtown revitalization and new development projects. But that’s not the whole story. Less than a mile from downtown gems like Railroad Park and Regions Field, inner city neighborhoods struggle with decaying, abandoned homes and buildings.